Early in the 1980s, I visited an extraordinary installation in the Centre Georges Pompidou. Viewers wore special slippers to enter a room, a carpet to ceiling, wall to wall kinetic/op art environment which seemingly undulated, changing entirely when studied from different positions. The artist’s use of lenticular printing on folded surfaces, in precise mathematical terms, created a wonderfully unsettling, challenging and dynamic experience. J.O. 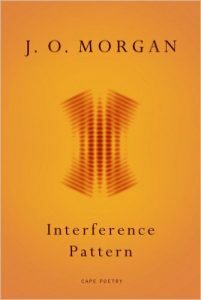 Morgan’s Interference Pattern is exactly of that ilk. and a great many of these italicised phrases are indeed similes. Certainly these poems have no titles, nor do they have separate pages, but the phrases (when found), coupled with that typographic alert on the content pages, do appear on the pages listed. Are they separate poems? Or is this perhaps a guide through a single epic (the poet has history with that form). The only way to discover is to don those slippers and enter Morgan’s fifth published volume of poetry. We know little more than that the poet is working with phenomena from physics and mathematics. I was curious; was the poet using visual patterns, flick-book style? He was not. Should we expect something devilishly clever but textbook-dry? We should not. If this is an epic (and it shows certain hallmarks), it begins in media res. sat without its plastic cap. the smooth face of wall off which she was flicking ants. I’ve heard a far more experienced reviewer than I say he reads three or four books a day when reviewing. Interference Pattern is not a long publication and could be read rapidly. To read it, however thoroughly, only once could not reveal its waves of images and sense. One reading might give something of the science. You might find a lurk of Carver’s dirty realism, but then again you might uncover faith and the Book of Genesis. You might learn something of how we understand memory, and you might read a tale unspooling. You might wonder if the tale is real, for sometimes it has a filmic quality. Then again it’s witty here, but elsewhere visceral. Perhaps it’s a dreamscape. There are folkloric aspects too. Sometimes in those flickering patterns you might catch something of David Lynch. Only the foolhardily confident would trust a single reading. Perhaps your subsequent readings will repay you with glances of Calvino; you will be aware of strong rhythms and accomplished internal rhymes, and note where the poet subverts clichés. Yet continue through these stanzas and you hear how the poet is doing something seriously subversive with metre. You think, I probably ought to read it again. Even so, your perspective may shift. Recent awards perhaps suggest contemporary poetic challenges will not come in lyric form, yet this is lyrical. Is it Science or is it Art? Those disciplinary titans are tightly bordered, are they not? Many shore up that great division – those prepared to bridge it are frequently termed adventurous. In Fiesole, that might have surprised Milton and Galileo, seeking their undivided learning. So it is with Morgan. I am ashamed of how quickly I forgot the name of that extraordinary creator in the Pompidou. Yaacov Agam. In Interference Pattern, I have discovered something equally mind-bending; I will not lose J.O. Morgan’s name. Scotland is represented on the Eliot list – brilliantly.